Defining and explaining terms with regards to user experience and goal-based philosophy. In this series I will define terms and phrases related to user experience, even though there are already official definitions e.g. by ISO (international standardization organization). But in many cases these definitions are of bad quality and full of compromises. They are outcome of a standardization body with literally hundreds of interests. One bad characteristic is that some definitions use examples or feature lists to explain a term, rather than defining it. To my understanding this is a no go. However, a definition also should be accompanied by comments or a discussion. It happened many times to me that a definition comes as a surprise. But after an explanation, things will become more approachable, and it will help to put the pieces into their places – especially in case you define a set of terms. Comments might benefit from simple sketches and from putting different terms into relationship to each other. The idea of defining user experience terms grew from the deep wish to explain certain terms in training courses and lectures to non-UX professionals who are no subject matter experts, no students of that area. In many cases people are overwhelmed by new terms and phrases. Here is the thing: I use these definitions to explain the user experience, to connect and differentiate between terms. They are not official, but a different point of view. Many of the other definitions (e.g. ISO) were not working for teaching purposes and they were not compatible to other terms to explain the wide area of user experience. In addition, it has not been possible so far to connect other subjects like gaming to user experience. I want to change this with this little series. Goal is an achievement which a person is trying to reach. (in football, rugby, hockey, and some other games) a pair of posts linked by a crossbar and typically with a net between, forming a space into or over which the ball has to be sent in order to score. a cage or basket used as a goal in other sports. Even I took the football goal metaphor for the image, it is just a mnemonic rhyme. What I am looking for is the person’s ambition or desired result. The flow goal is a major achievement, like finishing the shopping of an item and owning it after that. After reaching this achievement the person is selecting the next achievement, which might not be related anymore to the goal she just reached. The next flow goal is a new story line. The atomic goal, in comparison, is an intermediate achievement within the story line, like adding an item to a shopping cart, or changing the amount of a certain item in a shopping cart. Usually a flow consists of several atomic goals. The running order of atomic goals is often predefined by the flow, e.g. the person must add an item to the shopping cart, before she can pay for it – regardless if this is done online or in a supermarket. 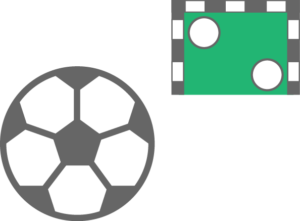 The goal-directed or goal-driven philosophy is based on Alan Cooper’s ideas described in his book “About Face: The Essentials of Interaction Design”: People always have a goal, like setting-up a Raspberry Pi, booking a concert ticket, finding food, falling asleep, finding inner peace, or maintaining inner peace. The goal is a key term for explaining the user experience terminology in this series, and as next I will discuss the term “user”. As a side note: “About Face” was the first ever interaction design related book I read cover to cover back in 2007 and it was the first interaction design related book I purchased for my own library. I think it still is a relevant book to get into user experience and interaction design, but there might be easier reads to get started in this area nowadays – but at some point, you really should read it in case you are into these topics.